Discounting is Like One-Night Stands! Last week, during a pricing workshop I was conducting with a Legal firm, the room went deadly quiet when the female head of one of the practice areas of the firm commented that “…discounting was like one-night stands”. Once everyone had picked up his or her jaws from the floor, she went on to defend her statement eloquently and very well. Once you let the discount genie out of the bottle, you’ve created the expectation and conditioned your customers that discounting is a way that you do business. There is absolutely no doubt that discounting erodes margins. And yet, in B2C markets, consumers today enjoy finding a bargain as much as they enjoy the hunt for it. Discounting is so prevalent today that Mark Ellwood is writing an entire book on the subject, Bargain Fever, which he interviewed me for last year. The book is due for release in October 2013. In B2B markets, the story is the same. In a 2010 survey, almost 90% of procurement managers identified their top cost-saving initiative as “pricing adjustments”. How does a firm escape the downward spiral of discounting? This is easier said that done, particularly for incumbents who are already discounting. The old adage “if you can’t measure it, you can’t manage it” is the starting point. You need to understand what types of discounts and how much is being granted before you can start to address it. One of the best tools to do this is the Pocket Price Waterfall (basically a stacked bar graph), which shows (from left to right) the list price of a product, all the various discounts granted to a customer, before arriving at the “pocket price”, or the amount that hits the bank account. Once the discounts have been identified and quantified, actions can then be taken towards minimising or reducing the discounts. Discounts should be granted to reward positive customer behaviour, and withheld to encourage it. In a B2B context, this may mean that an intermediary who warehouses your product for you provides more value than an intermediary who doesn’t. It makes sense to share that saving with such an intermediary via adopting a value-based approach to the price s/he buys from you at. There may also be opportunities identified via the Pocket Price Waterfall to make “stealth price changes”. This could included reducing free deliveries to customers within a 75km radius or Melbourne or Sydney, rather than 100kms. Furthermore, the Pocket Price Waterfall can be a fantastic sales tool. When customers ask for a discount, the sales rep armed with a Pocket Price Waterfall analysis can reply, “Well, do you know you are already getting this, this and this discount?” Such number can come as a surprise to many customers. 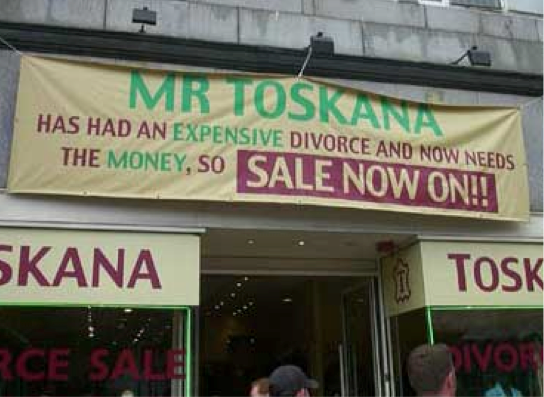 The photo always gets a few laughs, but the serious side of it is that no one really knows when Mr. Toskana will have his next sale. Will it be when he re-marries? Will it be when (heaven forbid) he gets his second divorce? There are a couple of other things you can try to reduce discounting. Firstly, create a discounting budget for the sales force…and once it’s gone, its gone. And secondly, as Reed Holden points out in his excellent book “Negotiation with Backbone”, “it's a negotiation, not a surrender”. If you’re going to grant a discount, get something immediate in return. And as for putting the one-night stand genie back in the bottle, I leave that for a more qualified writer. Should Your Prices be on Your Website? Hardly a month goes by without a client asking me, or someone posting the question in an online forum. It’s one of the biggest questions many Leading Companies have to confront. Do I put my prices on my website? Several years ago, Canadian National confronted this very question and made a very courageous decision. Not only did they publish their freight cartage rates on their website, they also removed all rebates, discounts and hidden charges, and simplified complex upgrade formulae for different types of rail cars and proportional payload calculations, amongst other pricing related initiatives. But wait, there’s more. The company also published a pricing calendar on their website, which listed the months in which shipping rates would be reviewed on an annual basis. There are a couple of benefits associated with this level of pricing transparency. Firstly, it should reduce customers’ price sensitivity or, conversely, confidentiality drives greater price sensitivity. Secondly, pricing cannot be treated as confidential. It’s ‘out there’, and customers and competitors have the hard facts. Thirdly, transparency should reduce customer power. As long as the policy is adhered to, there should be less demand for cheaper prices. Finally, there should be less time spent negotiating prices and resolving invoicing disputes. Perhaps an even more interesting example is provided by the website HumbleBundle.com. What’s interesting about this business though is that it doesn't have list prices: its sells bundles of digital products (games, eBooks, etc.) using a Pay-What-You-Want pricing model. But the site makes amazing use of lessons from Behavioural Economics and Gamification: by displaying the average price paid for the bundle, and incentivising customers to pay more than the going average (by rewarding them with two additional products), the average price keeps rising. No wonder the site has generated $23mill in sales. However, neither of these two businesses have truly direct competition. They both have indirect competition, road transport in the case of Canadian National, and sites like iTunes in the case of HumbleBundle. And competition seems to be one of the biggest factors in deciding whether to publish prices online. You are only as smart as your dumbest competitor in the world of pricing, and if one or more competitors publishes their prices, and customers value such pricing transparency, then it may become an ‘industry norm’. In other cases, pricing transparency may promote brand awareness or a competitive advantage. That doesn’t necessarily mean publishing actual prices though: just the pricing methodology might suffice. The home page of PodLegal.com.au promotes the fact that this law firm charges fixed prices, not by the hour, differentiating the company form others in the industry, without specifically mentioned prices. The only answer to the question “should we publish our prices on our website?” is “it all depends”. It depends on what your customers, your competitors and your industry wants or is accustomed to, versus what you want to do. Should You Tell Customers the Cost of Running Your Business? Last week I was asked to critique a piece of pricing communication. The one page document was designed to be printed and placed on the front desk of a professional services company to inform clients of the expenses involved in running the practice. Is this a good idea? While there is no doubting these are legitimate expenses that may be incurred in running a medical practice, there are a number of things I don’t like about this approach. Firstly, it is specifically designed to take away the need to have a conversation with the customer about pricing. I come from the opposite school of thought: that professional service firms should talk to customers about their pricing as early as possible. Get the pain out of the way early, and remove the risk of buyers remorse, invoice shock or any last minute umm-ing and argh-ing about “what’s all this going to cost me?” It's the opposite of what hotels do: spread the pleasure (during your stay) and concentrate the pain (of the invoice, when you check out). Finally, this is a one-off piece of pricing communications which, when the dust has settled on the price increase, will no doubt be assigned to the rubbish bin. If however, it was a value communication strategy, it would continue all year round, because value-based pricing is a process, not a project. In critiquing this pricing communication, I drew an analogy with Coca-Cola. Does Coca-Cola try and tell you what the cost of the can is, what the cost of the syrup and other ingredients is, or how many standard minutes of a person’s time was spent on creating a can of Diet / Zero / Cherry Coke? No…because no one cares about costs. They tell you it’s the most refreshing drink on the planet, because refreshment is the value it provides.